Even in the ‘gas-is-still-cheaper-than-bottled-water’ North America, sub-compact crossovers are now flying off the shelf like fresh donuts at a cop convention. Major players are quickly jumping on the bandwagon with respective products and Ford – officially revealing itself as a truck company – now has the excuse to bring over the Ecosport to the North American market. 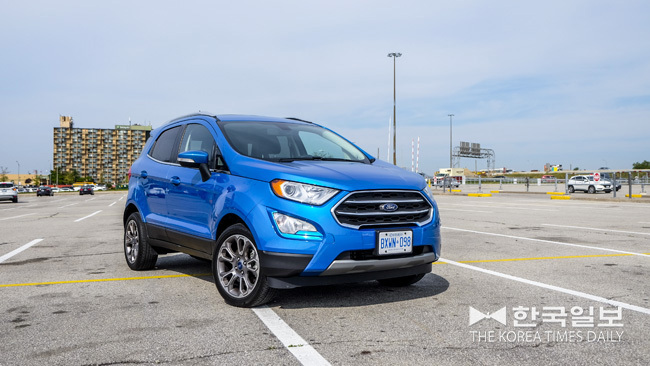 Weighing in as smallest and cheapest of the Ford’s utility lineup, the Ecosport (Echo-sport) is a familiar vehicle everywhere else. Starting its life in Brazil early this century, the latest version arriving on our shores is already the third-generation model. 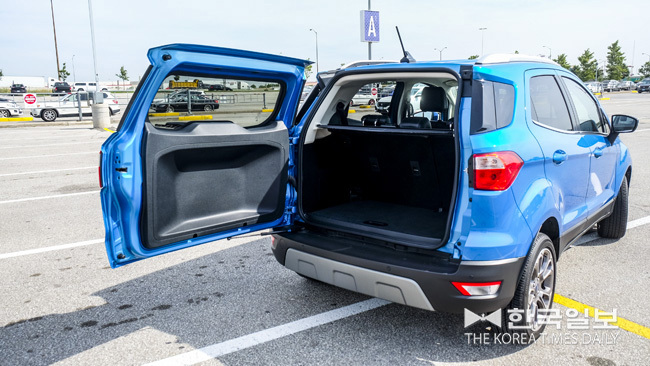 Slapping the faces of such rivals as Honda HR-V, Mazda CX-3, Hyundai Kona and Nissan Qashqai with the challenger’s gauntlet, the Ecosport attempts to attract potential customers with urban-friendly size, better-than-average fuel mileage, pothole-conquering ride height and friendly demeanor. The North American customers get to choose from two engines. 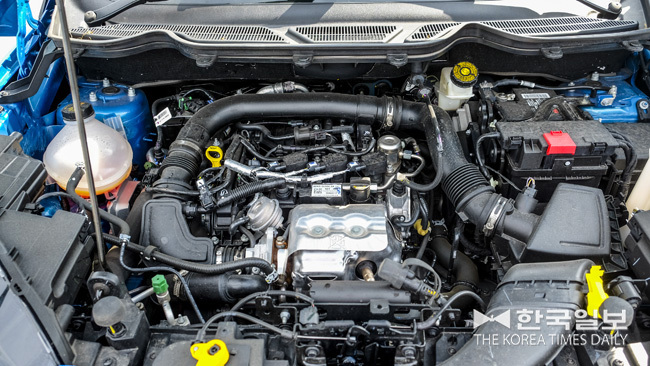 The one-litre, three-cylinder turbocharged (Ecoboost in Ford speak) engine develops maximum 123 horsepower and 125 lb-ft of torque. I’ve owned motorcycles with bigger and more power engines but this tiny mill gets the job done, considering the Ecosport tips the scale at comparatively svelte 1,370 kg (3020 lb). This motor is paired with FWD system only. Those wishing to have the AWD option ($2,500) should also check the box for the 2.0 litre naturally aspirated 4-cylinder engine good for 166 horses and 149 lb-ft of twist. Both engines are mated to the smooth-shifting six-speed automatic transmission. From the front, the Ecosport looks a lot like its bigger brother, the Escape. However, its side profile – with pronounced C-pillar and disguised D-pillar – is more in tune with the Explorer. It is nearly as tall and wide as the Escape, but much shorter in length. Rear-seat passenger space is pretty tight as the result. The base S model starts from $20,999, SE $25,099 and Titanium from $28,599. The SES ‘sport’ model is available only with the 2.0 litre engine and costs 800 dollars more than the Titanium, but its option list is shorter. The 1-litre Ecoboost Titanium test-vehicle provided to this writer boasts a long list of goods, including 17’ alloys, Bang Olufson premium audio, heated leather seats, power moon-roof, navigation, auto climate control, as well as such safety systems as blind-side monitoring and lane-keep assist, rear-view camera and parking sensors. The three-cylinder turbo sounds coarse at times and there’s also a bit of turbo-lag when pushed, but the engine musters enough oomph for most everyday situations. One can choose ‘Sport’ mode with the gear-shift lever, but leaving it in Drive is just fine. The car’s short wheelbase makes it a nimble handler, without coming off as too eager. The ride is relatively stable and comfortable but going over large bump a little too fast can be jolting. For such a small vehicle, the steering should be tighter. As it is, the Ecosport’s steering wheel seems to belong to a bigger vehicle. As advertised, the Ecosport – at least the 3-cyl model – gets pretty decent mileage. The official rating is 8.6 litres per 100 km in city and 8 litres on highway. For the week I had it (turning off the auto stop/start system every time) I’ve managed to do little better than that.